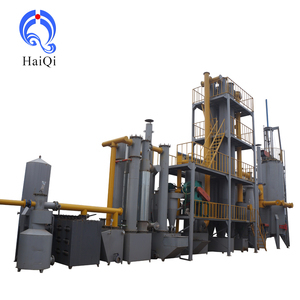 The production of pyrolysis gas called gasification is partial combustion of biomass (such as rice husk, woodchips, saw dust, crop stalk, coconut hull, bagasse, olive pomace etc.). Therefore, such a project is an ideal one with significant benefits for the area where there is plenty of biomass resources but is short of electric power supply or with higher electricity expense. The equipment can be safe and reliable operated with operational technology that's easy to be mastered by workers, and the maintenance and repair work is similar to ordinary diesel generators. The syngas from the gasifier can be used a) in internal combustion engines, b) for direct heat applications. However in order for the gas to be used for any of the above applications, it should be cleaned of tar and dust and be cooled. The main parts of Motor and electric cabinet will be packed by wood or steel box , then load into container. Normally hot gas mode is good enough for many applications which the customer's existing equipment are using coal, diesel, bunker, Heavy fuel oil and etc. 3) In a hot gas mode,the gas pipes from hot gas outlet to the user can not be longer, because the gas still has dust, coke, tar and etc. 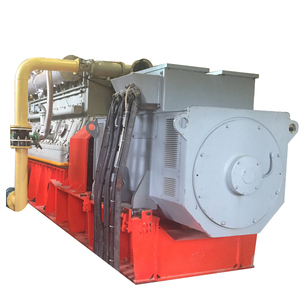 4) Normally hot gas mode is good enough for many applications which the customer's existing equipment are using coal, diesel, bunker, Heavy fuel oil and etc. 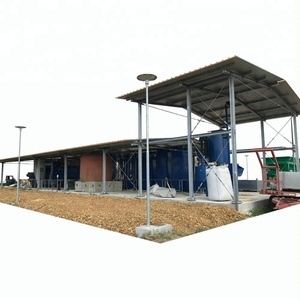 Biomass power plant Rice husk gasification technology is a new kind of biomass utilization technology. The rice husk in low oxygen gasification and high temperature environment, occurrence boiler gas is obtained , Producer gas into including CO/H 2 /CH 4 /C N H M etc. Use of natural gas engine unit will be converted to electricity. 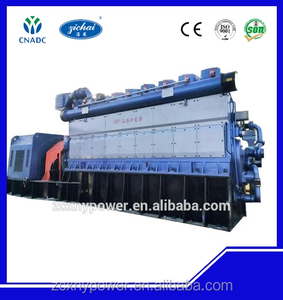 For same output kwh Biomass and Wood Gasifier Power Plant would be save 2-3 times space comparing to others from China. 4. Biomass and Wood Gasifier Power Plant adopts combined mechanical refrigeration and centrifugal seperation tech to cool the gas and remove the tar and the water would not contact the gas directly. While many gasifier power plant from China adopts water spaying to cool the gas and remove the tar it would cause bad water pollution. 4. Good cleaning device to control the tar content, ash content, water content and guarantee the gas clean and good. After splitting, the gas and carbon meet supplied air in the oxidation area and combustion takes place. The heat from combustion is utilized to maintain dryness, splitting reaction and endothermic reaction of the underneath reversion area. 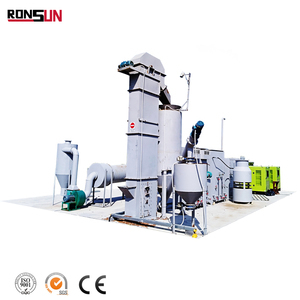 The production of pyrolysis gas called gasification is partial combustion of biomass (such as rice husk, woodchips, saw dust, crop stalk, coconut hull, bagasse, olive pomace etc.). Therefore, such a project is an ideal one with significant benefits for the area where there is plenty of biomass resources but is short of electric power supply or with higher electricity expense. Note : Main components and caloricity of biomass gas are subject to characteristic of biomass fuel and gasification method. installation case Packaging & Shipping 1.We are one of the leading manufacturer specialized in designing and manufacturing biomass machine in china with the experience of more than 13 years. 2.Manufacturing according to the CE quality control system guidelines. 3.Our products are widely recognized and trusted by users and can meet continuously developing economic and social needs. Gasifier type: downdraft fixed bed gasifier, updraft fixed bed gasifier and fluidized bed gasifier. 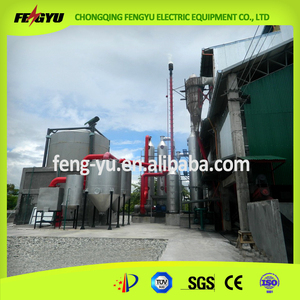 we will depend on the feature of biomass to use difference gasifier . different gasifier has different feastures . II. Q:What is the material of your products9 A: The material is carbon steel and stainless steel. After the warranty, we also can ensure that you can buy any necessary spare parts with favorable price within 5 years. They can help you select the most suitable products according to your actual condition. The ash\dregs are continuously discharged thr ough the spiral dreg machine while isolation from the exterior is maintained through the rotation valve. 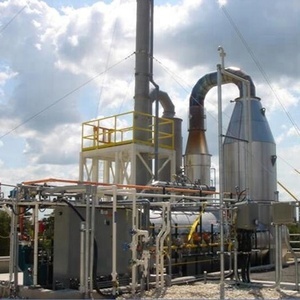 The gasification reduces high temperature gas,Which contains some impurities like dusts and tar. Due to the high temperature combustion process,tar is fully decomposed and pollution by the tar can be avoided. 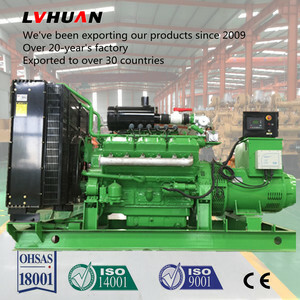 Alibaba.com offers 1,338 rice husk power plant products. About 16% of these are gas turbine generators, 9% are electricity generation, and 4% are rice mill. 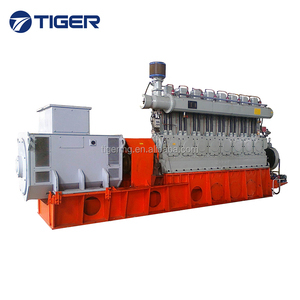 A wide variety of rice husk power plant options are available to you, such as generator, plant. You can also choose from free samples. There are 1,337 rice husk power plant suppliers, mainly located in Asia. The top supplying countries are China (Mainland), Vietnam, and India, which supply 99%, 1%, and 1% of rice husk power plant respectively. 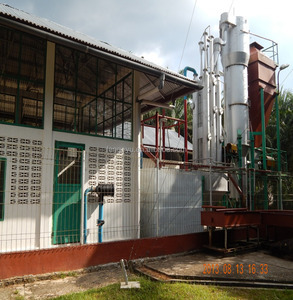 Rice husk power plant products are most popular in Domestic Market, Southeast Asia, and South Asia. You can ensure product safety by selecting from certified suppliers, including 863 with Other, 752 with ISO9001, and 305 with ISO14001 certification.